To many in the room, much of the discussion on whether Texas should subsidize private school tuition for some students with disabilities probably felt like a repeat. Activists, educators and parents stayed past midnight on Friday morning to give their thoughts on why the House Public Education Committee should or should not pass its own version of a "private school choice" bill, proposed by Rep. Ron Simmons, R-Carrollton. Some of those who testified had shown up months ago for similar arguments in front of a Senate panel. Under House Bill 1335, students who would qualify — those whose families have incomes below $200,000 — would get about $7,000 per school year. That would not cover the total cost of most schools, Simmons said. "Sometimes a school can be doing the very best they can, but for that particular child, it just doesn't work," Simmons said. He recalled sending his son Daniel, who is on the autism spectrum, to a private Christian school with a small program dedicated to students with special needs. "When we stepped out of the car that night, he said, 'I finally have a team.'" Early figures estimated Simmons' bill would cost $64 million to $211 million over the next two years, depending on the payment schedule to students, according to the Legislative Budget Board. An amended version of the bill put before the committee on Thursday is reduced in scope and limited in eligibility requirements and would cost much less, budget board staffers said. Dozens of people stayed late Thursday to testify. Critics argued it would not hold private schools accountable for providing services to students with disabilities. Dana Johnson, the special education director for Johnson City ISD, expressed concern that private providers are not held to the same state and federal standards as public schools for special education services. "Parents need to realize that at least they have a legal recourse in public settings. That's not the case in private schools," she said. Simmons responded that parents know their children better than educators. He said parents provide accountability for private schools by deciding whether to keep their children enrolled. Others argued HB 1335 would eventually lead to the expansion of voucher-type programs to include more than just students with disabilities. "It is unfortunate that what seems to be a bill to assist students with special needs has ulterior motives and special consequences," said Ginger Russell, representing Texans for Homeschool Freedom, a group of homeschoolers fighting against private school choice. "Opening this up brings regulations and ramifications to the homeschooling community that we do not have right now and we don't want." Some of HB 1335's language mirrors the major "private school choice" bill the Senate passed in late March — one of Lt. Gov. Dan Patrick's top priorities this session. That bill, Senate Bill 3, would create an education savings account program, as one of two programs to subsidize private school tuition, for low-income students and all students with disabilities. 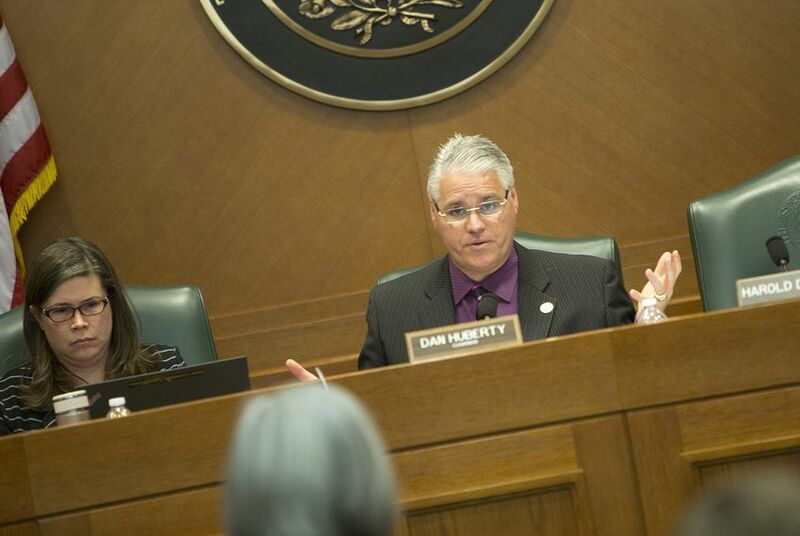 The House Public Education Committee has not taken up SB 3, and committee Chairman Dan Huberty, R-Houston, has previously said the issue is dead in the lower chamber. He joined a whopping 102 other members of the House in voting for an amendment to the Senate budget that would prevent any money from being spent for private school tuition subsidies. HB 1335 was left pending in committee early Friday morning.